In this episode of “Can These Bones,” co-host Bill Lamar talks with the Rev. Dr. Yolanda Pierce, the new dean of Howard’s divinity school, about why she’s excited about the challenges of theological education. Why would someone give up a faculty position at Princeton Theological Seminary to become the dean of a divinity school? The Rev. Dr. Yolanda Pierce offers two answers. One is that God said go. The second reason, as she explains to co-host Bill Lamar, is that she wants to be at the table as theological education is shifting. She also talks about her identity as a Pentecostal who believes that the Holy Spirit is still speaking, what it means to be a public intellectual, and the need for conversations about justice and reparations. This episode is part of a series. Learn more about “Can These Bones” or learn how to subscribe. Listen to all the episodes and learn more about the hosts. Bill Lamar: From Faith & Leadership, this is “Can These Bones,” a podcast that asks a fresh set of questions about leadership and the future of the church. I’m Bill Lamar. Today, Bill, you’re talking with the Rev. Dr. Yolanda Pierce, who is in her first year as the new dean of Howard University’s School of Divinity. What should we know about Dr. Pierce? Bill Lamar: Laura, Dr. Pierce is a superstar. She really is. She is included in The Root’s 100 Most Influential African-Americans. She is an ordained Christian minister with deep, deep roots in the wonderful Church of God in Christ. She’s a public intellectual, and she has a very, very wide-ranging intellectual interest, including literature and Africana studies and race, as well as womanist theology. She’s a Renaissance woman and an intellect of no mean ability. Laura Everett: God bless the theologian who decides to enter into administration in theological education in this moment. Let’s listen to your interview. Bill Lamar: Yolanda Pierce of Howard Divinity School is joining us on “Can These Bones.” Dean Pierce, thank you very much. Yolanda Pierce: Thank you for having me. Bill Lamar: What does it mean to be a public intellectual? You’ve been described as such. What does that mean? Yolanda Pierce: So, Chance the Rapper says, “I speak to God in public,” right? I want to have conversations about God in public life. Bill Lamar: Could you get me an interview with him? Yolanda Pierce: Yes, yes, I would love to. I hope he listens to this and we can all go to Chicago and hang out with him. Bill Lamar: I hear he writes big checks. Yolanda Pierce: And we could use one: Howard University School of Divinity. So I’m on Twitter a lot, and Facebook, and cable news and blogs and podcasts and TV, including a TV show on TV One. The reason I do that is not because I have anything in particular to say that’s extraordinary. It’s simply to say that we need more public voices who are claiming their faith, who are unapologetically black, unapologetically Christian and willing to say there’s a different way. There’s another way to do this. There’s a way that you can walk with Christ that actually looks different than these other models out there. So to me, to be a public intellectual is to allow myself to actually be vulnerable in public, to talk about my faith, to talk about the work that I do, and to recognize that more people will see me on a television show or will read something that I write for Time magazine than will ever read all of the academic articles and books and essays that I’ve written. In the classroom, I have 15, 20, 30 students, maybe, per semester, but in the public sphere, if I’m on MSNBC or CNN, millions of people view me. The problem, of course, with that, is you get the backlash, right? You get the people who write you, and you get the hate mail, and you get the death threats even. But I believe that we are, as Christians, called to do this publicly and unapologetically. Bill Lamar: You are described, in almost all the literature that I’ve researched, as a Pentecostal, that you name and own that tradition. And I think it is one that is misunderstood, and in some precincts maligned. Can you help thicken what Pentecostalism means, for those who really don’t know? Yolanda Pierce: I was born and raised in the Church of God in Christ. It is the largest African-American Pentecostal denomination in the world. And that will be and always is my home, where I identify myself. I grew up in a very rich, deeply Pentecostal tradition. It is a tradition that has been maligned for a number of different reasons. I think that there are often people who don’t think that Pentecostals are interested in education, and I am someone who has pursued several degrees and has a Ph.D. So I want to say that that’s a certain kind of stereotyping that has often happened with Pentecostalism. I think that there’s a way that people only understand Pentecostalism as a static, bodily worship, without an understanding that undergirding Pentecostalism is a deep pneumatology, a theology of the Holy Spirit. And many Pentecostals themselves have a deeply nuanced understanding of their theology. But I think that I still identify and remain a Pentecostal today because I believe in the work and the power of the Holy Spirit. I believe that God is still moving in the world. I believe that the Holy Spirit is still speaking. I believe that it’s only the power of the Holy Spirit that allows us the possibility of breaking down some of the barriers that we’ve created and erected in our nation and in our world. So God is moving. And the Holy Spirit is present and alive. And instead of, for Trinitarian Christians, the Holy Spirit being the redheaded stepchild of the Trinity, as a Pentecostal, I affirm its rightful place in the Godhead as active, alive, present and here with us. Bill Lamar: So there are seismic shifts in theological education. Will it be brick-and-mortar? Will it be online? The economic model for theological education is shifting, changing, maybe broken. Students are amassing massive amounts of debt. There’s a lot going on. Bill Lamar: And you said yes to a deanship. Share with us why. Yolanda Pierce: So one part of the story of saying yes to a deanship is that I’ve learned to obey God. God said go, and I said yes. The other part of the story is that, as you mentioned, theological education is in crisis. It will look radically different in 10 years than it looked a generation ago. So I decided I actually wanted to be at the table as it’s shifting, as it’s changing, growing and perhaps even declining. What should it look like? What should it look like in a landscape when we have people who are spiritual but not religious? What should it look like when we have a lot of people who consider themselves “nones” -- n-o-n-e-s -- not belonging to any particular religious tradition? What should it look like when we know that now less than 50 percent of those who have theological education will actually end up doing primary pastoral ministry? Most are not going to be pastors or preachers or ministers at churches anymore. So what does theological education look like when you are no longer training primarily pastors? As I was asking myself these questions for the years that I was a professor at Princeton, I decided I needed to be on the other side of the table helping to shift it, helping to change it, helping to make space and room for those who very much feel that they have a vocation, a calling from God, but that vocation might not necessarily lead them to the pulpit on Sunday mornings. Bill Lamar: You know, some years ago when I first went back to work at Duke Divinity School at Leadership Education, one of the things that my colleagues were considering was, How do you train people to be Christian institutional leaders? One of the anecdotes that I shall never forget is Will Willimon, once he was elected bishop in the United Methodist Church from the deanship at Duke Chapel -- he said once he was elected, he was given a set of keys and he was given a lawyer’s telephone number. That was the conclusion of his training to be a bishop. What would you say about the training for this work, the preparation for this work, and also the change, the shift in scale and scope, from being a professor to leading a school? Yolanda Pierce: So here I would say that the African-American Christian context actually has a leg up on the crisis situation, by which I mean that many of our pastors have traditionally been bivocational. Many of our pastors have always occupied a vocational calling for the church, but also something else. They’ve learned how to merge their “something else” -- their other identities as a schoolteacher, a principal, a business person -- and also what they do in terms of their labor for the body of Christ. So what I’m interested in are those conversations with people who have been able to see that the work that they do for ministry may not be their primary job. It may not be the job that pays the bills, and yet it is also what their heart is. It’s where their purpose meets them; it’s where their joy is. How do we prepare people to pursue their joy? It’s not easy. There’s no Joy 101 class. Except the people who come to seminary, who come to divinity school, very much do so because they have a calling. They sense that God is moving in their lives. They want to respond to that calling, even if they know that that calling might not lead them to leadership within a church setting. Those are the questions that occupy me in a way that I never actually had to think about as a faculty member whose focus was her own research and writing and teaching. Bill Lamar: What if the answer to that question is, “It’s not worth it”? Yolanda Pierce: That’s a tough, tough answer. For some people, it may not be worth it. We might actually have to see the decline of some seminaries and divinity schools, the way that we’ve seen declines in mainline denominations. Some things might die, but other things will grow. And if as Christians we consider ourselves a resurrection people, some things die so that other things can be called to life. I think that theological education has to be streamlined. I think it will look radically different. I think it will be smaller. I think we will continue to see the closing of schools, and we’ll see the mergers of other schools. That actually doesn’t worry me. Instead of us thinking about that as crisis, let’s think about that as potential and possibility. Bill Lamar: So you see it as opportunity? Yolanda Pierce: Absolutely. Opportunity. And so what the world needs now are people who are not only theologically trained but who are open to the realms of politics and sociology and business and health care. All of these different realms where we need people who have a vocational calling. And that vocational calling, like I said, might not be the pulpit. What would our health care system look like if not only did we have single payer health care, but if we had theologically trained people who were working in tandem as chaplains, as bioethicists, as people who are literally on the front lines of health care? Because you’re caring for both the body and the soul. So let’s talk about health care and theological education as a growth area. Bill Lamar: I remember years ago I would read “Theology Today” and Princeton would advertise their doctor of ministry program, and the language they used was that of weaving. It seems like you are casting a vision of weaving, of an interdisciplinarity -- that a theological education can be a centering, a ballast for deepening conversations in other fields of inquiry and in other areas of practice. Am I hearing that? And so there’s this weaving and meshing and quilting together of various disciplines, but theological education can be at the center of that. I want more men and women of faith, whatever faith tradition that may be, to be at the center of important national and international conversations. Bill Lamar: Traditions such as ours -- I mean, people speak of the black church, but it’s more appropriate to say the black churches -- it’s a very diverse tradition. Yolanda Pierce: That’s right, exactly. Bill Lamar: But in the precincts where our tradition is conservative, and not just in our tradition but in others, how do you think about interreligious dialogue? Because the landscape has become much more diverse, in terms of practice. You mentioned earlier about the nones. How does theological education shift, when before, we were in an imaginary -- a Christendom where the culture belonged to Christianity? How do you help to do that kind of work? Yolanda Pierce: I love what you’re saying about the rich diversity of black churches, and I think that that’s worth sort of pausing for a second, because there is no monolithic black church experience, nor is there a monolithic white church experience, as well. There are varieties of Christianity. And so one of the things that I see is, within many African-American contexts, a deep theological conservatism, but socially, politically, quite liberal, right? What that allows for are opportunities to come together, opportunities to rally, to protest, to have conversation partners. What do African-American Christian churches, of whatever variety of denomination, have in common with their Muslim brothers and sisters? Quite a bit, right? And it’s not just about shared theological texts, but for many, it’s their experience of being peoples at the margins. What it means to constantly be under surveillance, what it means to be the threat, the national threat. And so under all of these structures are opportunities to do interreligious dialogue, and the interreligious dialogue matters because people’s lives are impacted because of their faith. That’s what matters. So I see interreligious dialogue as absolutely necessary for the flourishing of the church. Bill Lamar: For our listeners who have either found themselves or will find themselves in a very similar situation, where you go from pastoring a church to leading a district as a superintendent, or a conference or a diocese as a bishop, what very practical things did you have to shift in your mental model to move from that classroom experience to managing budgets, managing people, dealing with cultivation of resources, friend raising, fundraising? Talk to me about that, because many of our leaders have those kinds of transitions, and I’m sure you can teach us something. Yolanda Pierce: Nothing prepares you for that. Yolanda Pierce: So all my years of education, and Ph.D., and years teaching as a professor -- nothing prepared me for that. It is wholly other. And because nothing prepared me for that, I now realize we have to actually create a framework to prepare people for that. We need to teach people how to deal with budgets. Many pastors, of course, are already dealing with budgets, but budgets at an even higher scale. We need to teach people some very practical skills about fundraising and philanthropy. We need to teach people, How do you write grants? How do you solicit grants? How do you fundraise? How do you find resources for your churches or your religious organizations? Those are actual classes that we can implement. Those are actually skills that we can teach. We just haven’t done it. And so I’m looking back on my own experience. I fell into this, and I’m learning as I go. And I’ve had great teachers and mentors. The mentorship model is important. The way that, for seminaries and divinity schools, we send students to churches to do a field education experience. We assign them a mentor; we understand that they’re under a system of apprenticeship, for better or for worse. We need that in organizational structures. I need a mentor to be able to walk me through some of the crises that are inevitably going to come, as I am now running an organization and no longer just a teacher in the classroom. But classes can prepare people to do that. And I really did. I really had to learn some basic skills that, frankly, I would wish that we were teaching in college, let alone in graduate school, as preparation for what the work actually looks like. Bill Lamar: I fixed a toilet the other day. Yolanda Pierce: So precious little time in that golden space of waiting to hear God speak for your Sunday sermon, and a lot of practical time dealing with just the issues of life. We can teach those skills, but we have to be honest that those are skills that need to be taught. Bill Lamar: One of the things you remind me of is I have to tell myself very frequently that those things, too, are holy. Bill Lamar: And those things make possible the heart of the life of the church. Hearing the voice of God, following God, being swept up into the mystery, and swept up in the transformation of the world as God leads us in that direction. But that work is holy. It matters that our students have transcripts. It matters that we talk to the financial aid office. And so I’m learning on the ground that all of the tasks that I am giving unto God actually contribute to my students’ vocation. Bill Lamar: What brings you the most joy in this new work? Yolanda Pierce: That’s a tough question. For a long time, I don’t think I could answer it, because I just had a lot of fires and frustrations, and so it didn’t feel like much joy. What I say now is that I know I’m planting seeds. I’m planting seeds of crops that I might not even see grow or come to fruition, but the small changes that I’m making at Howard, the skills that I’m learning which help me to grow as a scholar, a professor, as an administrator, are seeds, and they are being planted. And I will continue to water them, and I might not see the crops grow. So it brings me joy to know that in every little small area, progress is being made, even if I can’t necessarily put my hands quite yet on the progress. Bill Lamar: What is frustrating you? Yolanda Pierce: OK, so what is frustrating me? This is my first experience at an HBCU, historically black college or university. There are only in the country now six HBTIs -- that stands for historically black theological institutions. It is frustrating for me to see that there are only six, because the vast majority of HBCUs were actually founded as training grounds for ministers and teachers. And so hundreds of [institutions] in the 19th century were founded to train black men and women for teaching, for ministry. And we are now down to six. And so it’s frustrating to me that we don’t sometimes recognize the legacy and the foundation of these institutions, and value them. I left a very resource-rich institution, Princeton, where I learned so much and gained so much, and I am now at a very resource-strapped institution, whose legacy is so incredible. But I’m frustrated with how there isn’t a narrative that theological education owes its debt to these men and women of African descent who sent their sons and daughters to these schools in the 19th century and said, “Learn the word of God.” We owe a debt to that, and we don’t recognize and we don’t repay the debt that we owe. That’s heavy. Talk to us about that quote. Yolanda Pierce: So I’m a theologian. And I spend a lot of time thinking and writing and speaking about the heart of the matter, for me, which is how we talk about God, how we talk to God, how we listen to God. And these past couple of years in particular in the United States, given our political climate, I’ve been thinking about what really matters. We have a lot of conversations about equity, a lot of conversations about fairness, a lot of conversations about equality, and I don’t feel like those conversations get us to the heart of the matter. And so let’s talk about justice. Let’s talk about reparations. Let’s talk about repairing and restoring. It’s the way in which people want to have a conversation about forgiveness, but they don’t want to have a conversation about reparations. They want to talk about how do we get along, but they don’t want to talk about the wounds and the deep hurts that undergird the disease that keeps so many of us apart. So I’m for plain talking and for truth telling. I think, actually, this is the work of the gospel. How do we begin to tell the truth? How do we begin to let those who have been silenced actually speak? I’d love to talk to people about reconciliation, but reconciliation is the end of the process. Reconciliation is at the very end; that’s what you do right before you go home. Instead, the conversation has to be about this truth telling. It has to be about examining and cleaning the wounds. It has to be about repairing and restoring. Instead, the deep-down, dirty work of what it means to be in community and fellowship with one another, that will require tears and will require sacrifice and will require some people giving up their privilege -- very few people want to talk about that. So that’s where I insert myself. Bill Lamar: I want to ask again the question you ask at the end of that quote. So many people are trying to get traction around these questions: How can we act justly? How can we love mercy? How can we walk humbly? How? Yolanda Pierce: We have to believe that that framework actually will take us somewhere. I think it starts there. And so the questions of justice -- we also have to talk about justice for whom, right? And we often don’t want to talk about that. What I’m trying to suggest here are uncomfortable conversations that take for granted that we want to see a more just world, that take for granted that at the heart of the Christian vocation is this vocabulary of love. And so if we take that for granted, and if we actually believe that humility and humbleness are values and virtue, then these conversations about justice fundamentally shift. So we can’t, for instance, talk about law enforcement or the criminal justice or injustice system, right, unless we’re talking about justice for whom, by whom, to benefit whom. I’m taking for granted that there are men and women who very much have at their foundation a sense of this corporate identity rooted and grounded in love and humility and justice. And those are the people that I very much want to call my family of faith. I am deeply concerned about how the title, the language, the label of Christian gets co-opted by a group that is at the far right, and those of us who deeply value what it means to be called, to be a Christian, to be a follower of Christ, somehow don’t get to insert ourselves in those conversations. Yolanda Pierce: I have so much hope when I meet young people, not just folks in seminary and divinity school. When I meet the young men and women who are chanting in the streets of Ferguson, and they’re 16 and 17 years old; when I meet undergraduates at Howard who are serving as chaplain assistants and at 20 years old are still saying, “There’s something here in this faith for me”; when I meet the men and women who leave behind everything, sometimes including their own families, to pursue theological education, to go to divinity school, to go to seminary, to take on the loans and the debt, to simply say, “God has called me to do a work, and that work is urgent,” it gives me such deep hope. I see that right now, even though we are at this crisis point, it is also a “potential” moment. It is also a kairos moment, in a sense. And so I have a lot of hope when I see folks out at a Black Lives Matters rally, when I see them protesting at Capitol Hill, and being here in D.C., the center of so much protest, the center of so much of the resistance movement. I have so much hope when I see young people who are 14 and 15 or 25 and 30, because they are not giving up on the idea that their faith, that their deep involvement in religious communities, matters. That gives me a great deal of hope for what the future of religion looks like, what the future of faith looks like, and the idea that this interreligious dialogue of which we have to be a part is the possibility for freedom for a lot of different groups of people. Yolanda Pierce: Real good. Real good. Thank you so much. Bill Lamar: Hope to talk to you again soon. Thank you. Yolanda Pierce: Thank you, Rev. Lamar. Laura Everett: That was my co-host Bill Lamar’s conversation with Yolanda Pierce, dean of the Howard University School of Divinity. Bill, there is so much to discuss in this, but first I want to say that any theologian who starts her exploration of what it means to be a public intellectual by quoting Chance the Rapper, to me, is an exceedingly good place to start: “I speak to God in public, I speak to God in public / He keep my rhymes in couplets.” It’s so good, Bill, and it’s so right. Laura Everett: Let’s talk about what it means to be a public intellectual. It’s a risky move, especially in a field that prizes surety and declarative statements. I’ve followed Dean Pierce on Twitter for a while -- she’s @YNPierce -- a really remarkable woman who both asks questions in public and engages with her community. What do you think is at stake for someone who’s a new dean of a seminary serving intentionally in the role as a public intellectual? Bill Lamar: I think a lot is at stake, because when she speaks, she speaks also for an old and storied institution. And so she always has to be very careful, in my opinion, about what she says and how others may read it, and then how it may cast light or potential shadow upon the school. I think because of her constituency and the persons with whom she speaks, and those she’s recruiting, that her social media presence is probably helping to enlarge the footprint of Howard University School of Divinity. As I take a look at her Twitter feed, there are very light things that she may tweet about; there are also political and theological things. So it seems to me that her strategy is to just be authentic and comfortable. And that same authenticity seems to be what guides her deanship. Laura Everett: This is so resonant for me, that question about authenticity and interactivity. When I teach church leaders about using social media for ministry, I remember the time I was teaching a group of bishops of a denomination that shall remain nameless to protect them on this. I was trying to help them learn how to speak to God in public, how to speak a word of blessing to the people, and ask questions. And I was trying to teach that sometimes that means being vulnerable, asking questions, acknowledging what we don’t know and learning from the people that we’re interacting with in public. And so I think about the balancing act of someone like Dean Pierce, who is asking questions and interacting with people at the same time as she is interacting and representing an institution -- how hard that is. I know you’ve had that challenge, as well, or you’re thinking about it, also leading a storied institution and trying to speak of God in public. Bill Lamar: I would say this, Laura, that whoever gave that advice -- this is very, very poor advice. I mean, when you cease to wonder, when you only lead in prose and think in flat, one-dimensional ways, and you can’t stir the poetry in the soul, or the grand visions of the world as we think it ought be, or as we speculate that God intends for it to be, that’s the death knell. When I think about leading a place like Metropolitan, really being blessed by our church to lead this church, I think about wanting to be as authentic as I am both in the church and in other spheres, so that I don’t have the burden of trying to be three or four Bill Lamars. The Bill Lamar at home; the churchy, preachy Bill Lamar; the Bill Lamar the advocate or the guy testifying at city council; or the Bill -- you know, it’s just too much to try to keep up with three or four different people in one dark body, as Du Bois might say. So I’m trying to be one whole person. I want there to be joy. I want there to be laughter. I never forget that I’m serving Metropolitan. I mean -- really, this may be too nerdy and in the weeds, and this is why there’s the magic of editing -- but I’ll never forget in theology talking about the hypostatic union of the divinity and humanity of Christ. So for me, I feel like there is a hypostasis between just Bill Lamar the regular guy and Bill Lamar the pastor, institutional guy. I don’t really separate it. And it means I’m not carrying a burden; it means that I’m integrated, or at least becoming as integrated as healthily as I can be. I think that Dean Pierce offers us a really, really good model in that. Laura Everett: I so appreciated her awareness, too, that there is an evangelical role she plays by speaking in communities that would never read her books or her essays or hear her preach, but because she is being intentional about interacting with folks on social media, that she’s in conversation with people who will never enter the church, and that’s OK, and that she actually needs to be doing that in order to be fulfilling her vocation and preparing pastors to serve in a religiously diverse world. I really appreciated that wisdom. Bill Lamar: You know, one of the things, Laura -- and you were one of the persons I talked with early on -- I was very, very reticent about joining the social media movement, because I saw it as, well, I don’t know, like, ego-driven. Bill Lamar: Like, who would care what I’m thinking, what I’m eating, where I am? But what I’ve realized is that if there is something that is of import to you and you want to share it and you want conversation partners to deepen your thought or to extend it, that social media becomes an excellent tool. So one of the things I’d say to our listeners is it doesn’t matter how big or small you think your platform is, the ideas that animate you probably animate other people. And social media, for me, has been a great place to engage that. Bill Lamar: I think that iron does indeed sharpen iron, and it’s not the perfect venue for all kinds of conversations, but social media has been helpful. I think I could probably engage it more. But there are things that happen in the course of a day or a week, or if something says to me, you know, you should tweet this, you should put this on Facebook -- and I think it really has helped some conversations that I’ve had with folks along the way, with people that I see regularly and those I don’t see regularly. Laura Everett: So Bill, let’s shift just a second to move from Twitter to toilets, because you and Dean Pierce were joking about the holy labor of the mundane, of things -- for you, fixing the toilet. And, Lord Jesus, did I resonate with the idea of trying to do the work that is in front of me when there are 150 emails! I’m good at many parts of my ministry, but email is not one of them. And I really appreciated hearing Dean Pierce speak about how all of those things can be tasks given unto the glory of God. Bill Lamar: You know, I think first of all about your frightening alliteration of “toilets” and “Twitter.” I’m sure that there’s someone who is not very happy about that. Laura Everett: I learned to alliterate from you, Bill. Bill Lamar: But anyway, I really appreciated Dean Pierce talking about all of the very small things, the mundane things, the minutiae. I remember one of my professors talking about the tyranny of the immediate, all of those immediate things that need to be tended to. And I think as leaders -- many of those listening, I’m sure, will resonate with this -- you do what you have to do. You know, there are things that I could have called someone else to do, but it needed to be done, and I do it. I think the challenge is that you can lose the energy necessary for leadership if you do that all the time. I think you have to learn how to manage it. Part of it, I think probably for both Dean Pierce and for us, as we strive to become better leaders, Laura, is you want to be willing to do the things that everybody else in the organization is doing so that you can show that you’re a servant, so that you can show that you are willing to put as much skin in the game as others. But then there comes a time when if you continue to do those things, then there’s a mission creep, a possible brain drain, and you’re focusing on things that could take you off mission, off vision, off focus. So for me, it becomes a balancing act. And I think for both Dean Pierce and for us, it means we’ve got to find the secret sauce for the team that we build around us, both paid and volunteer, clergy and lay, that really, really helps to get that work done. I know that Dean Pierce and her colleagues are trying to find the people who can become a part of that vision, to really embrace the vision she has for the School of Divinity at Howard. Laura Everett: Well, and she’s someone who so clearly has a strong vision that is animating your work. When you were speaking with Dean Pierce, what did you notice about how she holds on to that vision of what a Christian institution like the Howard University School of Divinity can be? Bill Lamar: Well, I’ll tell you this, Laura. If you’re in Dean Pierce’s presence, you feel this exuberance, this energy; she embodies it. I mean, her physicality just exudes this love for the church and this love for -- if you remember a portion of that interview after I was trying to figure out why on God’s earth would she take such a difficult challenge as theological education is undergoing so many shifts, she was very clear that she wanted to be a part of the new as it emerged, that some things may need to die so that other things live. So she’s got a clear sense of wading into waters that are not necessarily tranquil seas. And I think, for many of us, we’ve got to understand that we are called into seas that are not always tranquil. And her early answer, from the beginning of the interview, about why would you do this -- she said, “Because God called me to it.” And on the one hand, you hear that, and that sounds, you know, trite, Sunday schoolish, but it came from a deep, deep place of knowing when God indeed is sending you forth for work and trusting that you will not be abandoned while you’re trying to accomplish that mission. So I walked away from her as a leader believing that if anybody could wade through these tumultuous waters, it would indeed be Dean Pierce. Laura Everett: She has such a strong sense of the active, dependable power of the Holy Spirit. Laura Everett: I heard her say only the power of the Holy Spirit allows us to break down the barriers that have divided us. I really appreciated that animating sense in her, that the spirit of God is active, active still. I would argue a little about it being a “redheaded stepchild” -- as a redhead. Just to quibble a little bit. But no, seriously, that she -- it came through so clearly in your interview, Bill, that what allows her to do this work is a sense that God’s provision is present and that she is planting seeds, and she might not see the crops. That she is holding both of those things in her hands, this sense of God’s provision, but also that she is working a good work that she may not see the fruit of. And that mindset is something that I want to hold on to as I also strive to lead a historic institution that is trying to find its second or even third act at this point. Bill Lamar: And, I think, her profound faith that God is the one who will bring the work to completion. And it reminded me, as I asked her the question about being a Pentecostal -- because so many people have characterizations about what that means that are just based in ignorance and caricatures that are very, very unimaginative -- her talking about the Spirit reminded me of what Willie Jennings shared with me about a commentary he was writing as a theologian about the book of Acts, where he says that the Holy Spirit ultimately does a couple of things. One, the Spirit blows us into places where we would not normally go -- and I find that to be very true. And the Spirit blows us into people with whom we would not normally dialogue. And so I really think as we do the work of leadership, expecting the Spirit to be alive and at work, we can expect God to blow us into places we may never have considered, as the Spirit did indeed blow Dean Pierce into Howard School of Divinity, and to blow us into people, resources, conversations in a religious dialogue that we might not normally choose. So I really feel like the Spirit’s at work in what we are trying to do and what our listeners are trying to do as they sense God’s hope of life in some “dry bones” situations. Laura Everett: Listeners, we hope you hear that vision of trusting the Spirit at work in your life, as we heard it at work in Dean Yolanda Pierce’s. Thanks for the interview, Bill. Bill Lamar: Thank you, Laura. And thank you for listening to “Can These Bones.” This was a whole lot of fun. There’s more about Dean Yolanda Pierce, including links to her writing, at www.canthesebones.com. Who are we talking to next time? 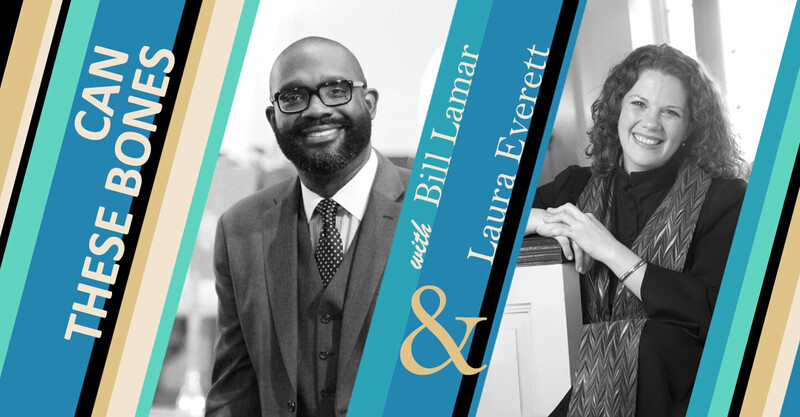 Laura Everett: Bill, I had a great conversation with the Rev. Dr. Eric Barreto. He’s a professor of New Testament at Princeton Theological Seminary. Bill Lamar: Can’t wait to hear it. “Can These Bones” is brought to you by Faith & Leadership, a learning resource for Christian leaders and their institutions from Leadership Education at Duke Divinity. It’s produced by Sally Hicks, Kelly Ryan and Dave Odom. Our theme music is by Blue Dot Sessions, and Yolanda Pierce’s interview was recorded at Howard University. Funding is provided by Lilly Endowment. We’d love to hear from you. Please share your thoughts about this podcast on social media. I’m on Twitter @WilliamHLamarIV, and you can reach my colleague Laura on Twitter @RevEverett. You can also find us through our website, www.canthesebones.com.